I know reviews have been a little slow lately, but spring break is next week, so you can expect some reviews coming up. I have some great ones in the queue, too. Today, I just want to take a little break to tell you about an amazing cause. Several bestselling indie authors have teamed up to write a poetry anthology. Best part? ALL (and I mean 100%, no exceptions) of the proceeds go to Dog & Kitty City, a no-kill animal shelter in Dallas run by the Humane Society. With thousands of pets being abandoned and euthanized each year, it's so important to support no-kill shelters that commit to keeping animals healthy and alive and finding them new homes. However, these shelters are overtaxed and underfunded. Please, consider buying this great (cheap!) anthology. You'll get an enjoyable book, and some furry friends will get a chance at a new life. The Quillective Project's mission is to turn the power of the written word into an instrument of compassion, hope, and generosity by putting that power directly in the hands of organizations that share our principles. 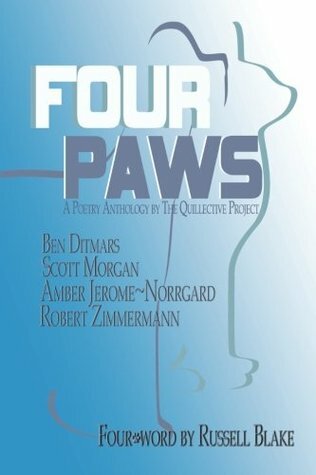 The 2013 Quillective Project is Four Paws, a poetry anthology featuring bestselling authors Scott Morgan, Ben Ditmars, Amber Jerome~Norrgard and Robert Zimmermann, with a "fourword" by Russell Blake. 100% of all proceeds from the sale of Four Paws will benefit The Dallas Humane Society's no-kill shelter, Dog & Kitty City. Your purchase of this book makes a difference.